Famous for its waters, Évian is a lovely town on the shores of Lake Geneva. Évian is known around the world for its waters, said to be healthful for drinking and for spa treatments. A popular resort for the wealthy in the 19th century, Évian retains some old world charm and enjoys a wonderful location on the shores of Lake Geneva. 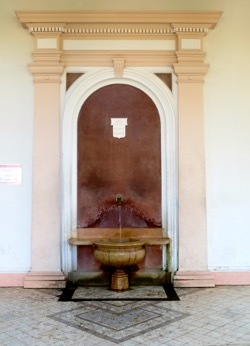 You can actually go to the source of Évian water, the Source Cachat, and fill your own water bottle! It's right in the center of town and it's free. You'll see plenty of locals bringing their shopping bags full of bottles to fill. You'll also see souvenir shops selling bottles of "pure Évian water" for prices as high as 6 euros! Source is the French word for spring, and you'll see both words used. The art nouveau Cachat Pump Room, right on Rue Nationale in the center of town, is today an information center about Évian water. It's only open in the summer, however, so check locally to see if you can visit. Rue Nationale is a largely pedestrian street, with shops, restaurants, and historic buildings, a great place to walk. Be sure to explore some of the small passages that lead from Rue Nationale to the Avenue des Sources and the Cachat Spring, as well as the ruins of the Château des Comtes de Savoie. Évian's location right on Lake Geneva (Lac Léman) provides beautiful views, as well as opportunities to enjoy the waterfront. It's delightful to walk along the quais. The water gardens, the small port, and the musical fountain (near the Marina) are all interesting. To see a bit more of the lake, you can take a boat ride. 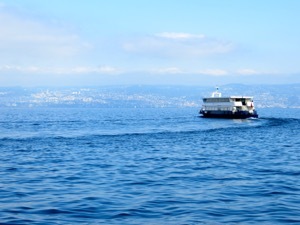 There is regular ferry service across the lake to Lausanne, Switzerland, a trip of about 35 minutes. You can wander around the Lausanne waterfront and take the boat back. It's a fun way to enjoy the lake. If you want to dip your feet in the water of Lac Léman, head east to Grande Rive and Petite Rive. These small pebble beaches offer swimming. There are also some small waterfront restaurants where you can enjoy lunch or a snack at a picnic table. To the west of Évian, there are beaches near Yvoire. For a different water experience, Évian Thermes, on the east side of town near the lake, offers a variety of spa experiences. Évian also has a lot of wonderful 19th century architecture, such as the lovely Villa Lumière, now the town hall, and the adjacent Palais Lumière. The Villa Lumière was built by Antoine Lumière, the father of the Lumière brothers of film fame, and it has served as town hall since 1927. The exterior is adorned with a vareity of sculptural reproductions, while the interior includes bas reliefs, lots of gilt, and inlaid wood. The hall and drawing room are open to the public. The Palais Lumière was originally used for hydropathic treatments and included a pump house and various treatment rooms. Today it serves as a Congress and Cultural Center. And, like many of these spa towns, Évian has a Casino on the waterfront. The casino also dates from the early 1900s and was designed by the same architect who did the Cachat Pup Room. The church of Notre-Dame de l'Assomption dates from the 13th century, with modifications in the 14th and 15th centuries. It is known for its frescoes and its wooden stalls in the chancel, fine example of flamboyant Neo-Gothic design. It's located just across the street from the Tourist Information Center. The church is also near the market square, and if you are in Évian on Tuesday or Friday, be sure to wander through the wonderful market. There are many local products, including delicious tomme de savoie cheeses, jambon (ham) de savoie, and other local specialties. Évian is also a good base for some excursions. In addition to taking a ferry to Lausanne, you can also visit several interesting spots along the lake. To the west you'll pass through Amphion-les-Bains, where the modern Évian bottling plant is located (about 5 kilometers/3 miles from Évian). Next is the town of Thonon-les-Bains (7 kilometers/4.5 miles), home to another delicious spring. Although Thonon water is not as well known as Évian, you will find it in France and it's served on some AirFrance flights. Continue an additional 16 kilometers (10 miles) and you'll arrive at the beautiful medieval village of Yvoire. If you're driving, park in one of the lots outside the walls and enjoy walking the streets of this lovely flowered village on the lake. If you head east from Évian, you'll pass the Grande and Petite Rives beaches and after 10 kilometers (6 miles) will arrive at the tiny fishing village of Meillerie. Dramatic cliffs drop off to the lake, and the views are lovely. If you wander up in the streest you'll come to a small 13th century church; the views from the road are wonderful. Jean-Jacques Rousseau featured Meillerie in his novel, La Nouvelle Héloïse, and it was also the backdrop for several films in the 1920s to 1940s. 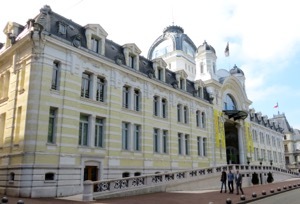 Above, The distinctive yellow and white facade of the Palais Lumière, Evian. Below, A ferry leaves Évian to cross Lac Léman to the Swiss city of Lausanne. Above, The Source Cachat, in Évian. Be sure to taste the water! 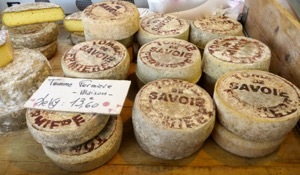 Below, Local Tomme de Savoie cheeses at the Évian market.